of gorgeous, fragrant, natural tomatoes. The work and love that go into our tomato sauce starts in March. Simona's grandad Gaetano works every day in the garden tending to the incredible array of vegetables, fruits, chickens, herbs and flowers. The tomatoes are planted in March and by August are ready to be picked and made into sauce. I rise, this late summers morning at 4.30am and head downstairs to the cantina. The sky is brightening, ready for the sun to rise over Monte Caruso, looming high above Foglianise. Across the valley other villages are waking up too, lights coming on, smoke rising, cockerels crowing. 1. I fill a big tub with water, and pour in a load of tomatoes. Swish around, from one tub, into the next, always rinsing, into the last tub and out into the crate, clean and ready to go. 2. Now we boil them in a huge pan over gas. Once the water is rolling, half an hour. Then out into a muslin lined wooden crate where they cool, and we break as the day is too hot now. 3. After lunch and a siesta, we start work again. Using a tomato pulping machine, we spoon the tomatoes in and two buckets collect the passata and the pulp. 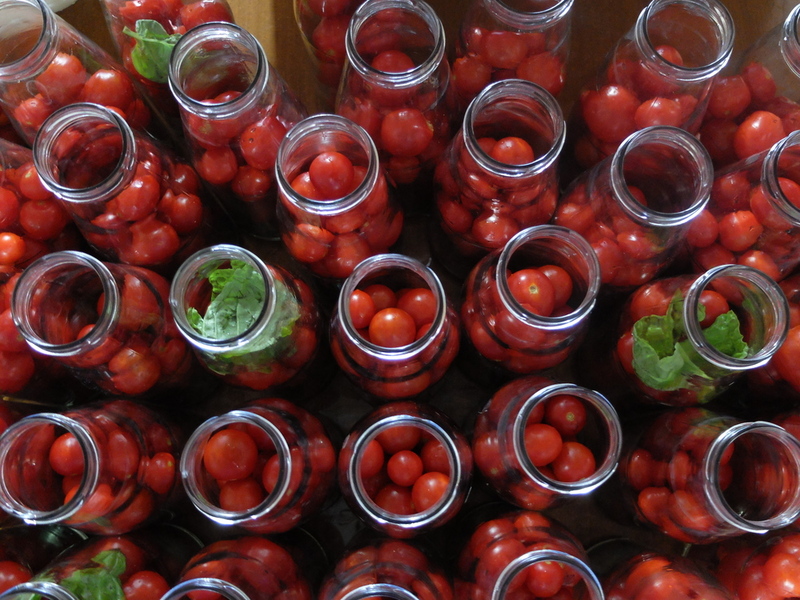 The pulp is spread back over the tomatoes to help fertilise, the passata is ready to be bottled. 3. We fill sterilised bottles with the sauce and fasten the lid (see con pomordorini recipe for instructions). 4. Now the bottles need to be pasteurised. We load up a massive drum with 100 or so bottles, Nonno Guatano impresed with my tetris like skills. Once full, we hose in water, covering everything and turn on the gas. Once the water is boiling, we pasteurise for 45 minutes, turn off the gas and leave the bottles and water to cool until tomorrow. 4. Take out, wipe clean and store. Sauce with cherry tomatoes and basil. Once we've made the salsa semplice, we then prepare the other two types of sauce that we do. Con pomordorini translates as 'with cherry tomatoes'. 1. We sterilise the bottles by washing the jars and lids really well in very hot, soapy water and then rinsing thoroughly. Put open end up on a baking tray and heat oven to 140c (120c fan) for 10-15min until completely dry. 2. Once cooled a little we fill 2/3s with cherry tomatoes, throw in a leaf of basil, and top with the simple tomato sauce. 3. Fasten the lid using a cap tightener and place in water. Once the pan, or in our case barrel is full, turn on the heat and when the water is boiling cook for 45 minutes and then leave to cool in the water. The following day or once the water has cooled sufficiently, take the bottles out, dry, and store in a cool, dry place. 1. In a food processor blitz together onion, celery, garlic, basil leaves and chilli and gently fry in extra virgin olive oil. 2. Add the salsa semplice and a sprinkling of salt to taste. Bring to the boil and then lower the heat to a simmer and cook, stirring pretty much continuously for 45 mins. 3. Working quickly, fill sterilised bottles (see con pomordorini recipe for instructions), wipe down, and fasten the tops with a cap tightener. 4. Have a large crate or barrel ready lined with a blanket. Put a layer of bottles, blanket. Another layer of bottles, blanket. Do this until all of the bottles are under the blankets. According to Nonna Carmela and Nonno Gaetano, this under blanket method improves the depth of flavour! 5. Leave for a day or two, take out and store.